How did Romans do division in their numeral system? Was it by repeated subtraction or did they know anything faster? The short answer, according to Turner (1951), is: we don't know. The Romans were not interested in recording theoretical mathematics, so we don't have any written accounts how they did it. It is assumed that whatever they knew was learned from the Greeks, but alas there is no Greek account (from the period) of a pure number division either, only of one dividing an angle (with minutes and seconds). Turner notes that Friedlein (1869) was still the most comprehensive modern source on the topic, and goes on to reproduce from Friedlein a conjectured Roman division method using the abacus. This is a sort of successive approximation, vaguely similar to short division because it requires knowing only some multiplication tables (only by 10 and 20 in the example below), but there is no evidence the Romans used this method (as opposed to something else). 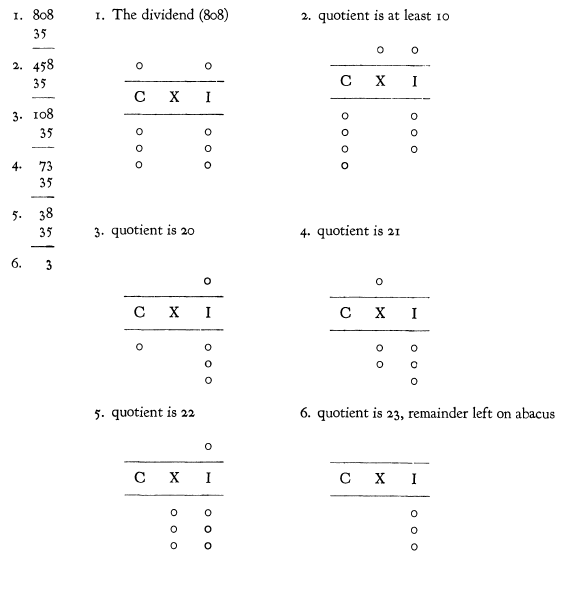 In the above method, the abacus is divided in two zones, but nevertheless only the remainder is represented on the abacus (the quotient is kept in the operator's head or elsewhere); the zone above the vertical divide multiplies by 5. It should be noted that even this method of representing Roman numbers on the abacus is conjectural. I don't know if any more recent research has been done in this area. As a side note (also from Turner), the Roman word for multiplication does imply repeated addition, but nevertheless the Romans likely learned from the Greeks a better method, based on powers of 10 (although unlike the modern method, it started from the largest power), first exemplified in Eutocius' commentary on Archimedes. The usage of using numerals for division neither existed nor was it necessary. Symbols were only used for recording results. This also explains why the romans used their system because it is easy for recording. Big numbers first and easy to remember symbols for the different steps of 100,50,10,10,5,1. 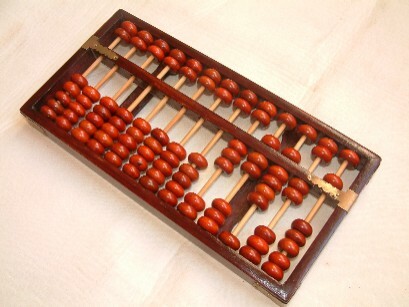 The operations itself were calculated by an abacus. People scoff often for because it seems something for a child, but an abacus is the fastest device for doing calculations, once muscle memory has learned to operate it effectively it is 10-100 times faster than a pocket calculator for addition and subtraction. I am not exaggerating, the first computers were doing contests against people with abaci and often lost. But let us return to mathematics and to ancient Rome. The Roman numeral system discouraged serious calculations. How could the ancient Romans build elaborate structures such as temples, bridges, and aqueducts without precise and elaborate calculations? The most important deficiency of Roman numerals is that they are completely unsuitable even for performing a simple operation like addition, not to mention multiplication, which presents substantial difficulties [...]. 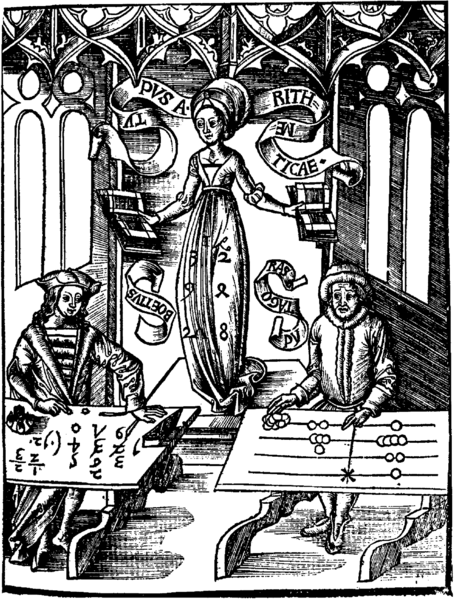 In early European universities, algorithms for multiplication and division using Roman numerals were doctoral research topics. It is absolutely impossible to use clumsy Roman numbers in multi-stage calculations. The Roman system had no numeral “zero.” Even the simplest decimal operations with numbers cannot be expressed in Roman numerals. [...] Try to write a multiplication table in Roman numerals. What about fractions and operations with fractions? Despite all these deficiencies, Roman numerals supposedly remained the predominant representation of numbers in European culture until the 14th century. How did the ancient Romans succeed in their calculations and complicated astronomical computations? Correct, Gary, they did not use roman numerals, they used the abacus. D'oh! On November 12, 1946 Private Thomas Nathan Wood of the 20th Finance Disbursing Section of General MacArthur's headquarters competed on a electric calculator against Kiyoshi Matsuzaki, a champion operator of the abacus in the Savings Bureau of the Ministry of Postal Administration.. Matsuzaki added 50 numbers of 3-6 digits in 1 minute 15 seconds which means he needed approximately 0.4 seconds for one digit. You can do addition, subtraction, multiplication and divison with ease, even square root is possible. Any other operation is extremely hard. This also explains why higher mathematics needed such a long time to develop because so powerful the abacus is for basic math, so useless it is for understanding and using powers and exponentials. Only the adoption of the vastly superior system of Arabic numerals allowed people to finally use numerals itself for mathematics, the Persian Al-Khwarizmi wrote 825 "On the Calculation with Hindu Numerals". In the image you see a contest between abaci math and numeral math. Abaci were finally abandoned and replaced with mental addition/paper addition and slide rules for multiplication and division which was the calculator during the 50s; it also supported higher math (powers, roots, logarithmic and trigonometric functions) in the necessary precision. I'm not all that sure that Romans had much need to perform complex division that often. Typcially, they used Abaci for general maths usage, and the Roman numerals were used for simple recording the results at the end of the process. Wikipedia goes into the symbols and usage - but this tablet allowed fractional counting (the Ө column on the right). 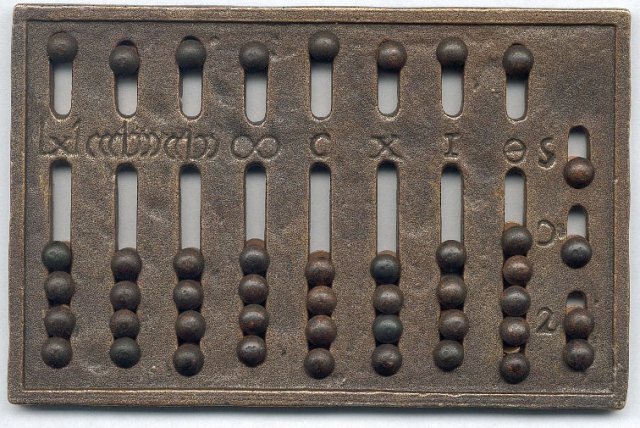 As you can see, though, division or multiplication would still be impractical using an abacus like this. You can find Stephen K Stephenson's video presentation of the technique described by Fizz here. You might like to follow the sequence of videos from the beginning. Egyptian division is basically Egyptian multiplication in reverse. The divisor is repeatedly doubled to give the dividend. The complication with Egyptian division comes with remainders. For example, 17 divided by 3." ... and without an abacus. Not the answer you're looking for? Browse other questions tagged ancient-rome mathematics or ask your own question. How did the Romans supply water in winter? Did the Romans use any other materials to reinforce their concrete?